According to a new market report published by Transparency Market Research, the global telecom service provider investment (CAPEX) market was valued at US$ 290.4 Bn in 2016 and is expected to expand at a CAGR of 7.1% from 2018 to 2026, reaching US$ 576.3 Bn by the end of the forecast period. According to the report, the global telecom service provider investment (CAPEX) will continue to be influenced by a variety of macroeconomic and industry-specific factors. Asia Pacific will continue to be at the forefront of global telecom investment, with the market in the region growing at a CAGR of about 7.7% throughout the forecast period. Asia Pacific region is expected to see prominent capital investment due to rising 5G-related spending from operators which are focused on strengthening their fiber-based fixed broadband and backbone networks. 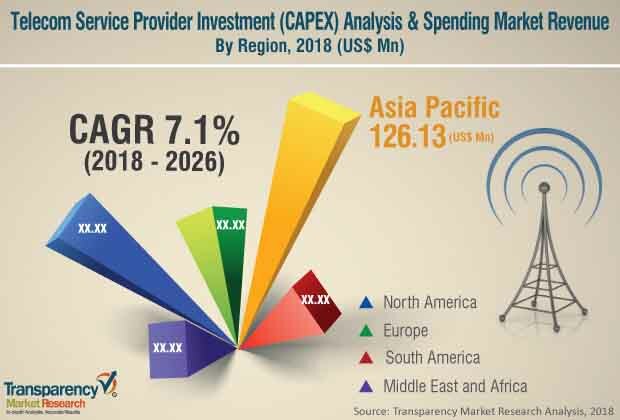 The global telecom service provider investment (CAPEX) is majorly driven due to rising demand for 5G connectivity which has led to a rise in investment from telecom service providers in every zone. 5G connectivity is likely to enhance the working of networks. Moreover, rapid development in terms of research activities with respect to innovative telecom equipment and services by equipment manufacturers is allowing telecom service providers to deploy or launch their 5G services as per their intended schedule. Furthermore, telecom operators are focusing significantly on expanding their network coverage range and network capacity in order to improve their market position. As demand for mobile broadband services continues to rise, mobile wireless network service providers are focusing on expanding their network capacity. However, the global telecom service provider investment (CAPEX) is expected to remain challenged due to the increasing emphasis of enterprises on owning and leasing telecom towers to telecom companies which requires less capital expenditure. However, penetration of Internet of Things (IoT) technology is expected to offer huge opportunities for telecom operators to invest, in order to offer advance products. The report offers detailed segmentation based on the hardware (vendor type, equipment type), services, and network type. By equipment type, hardware has been segmented into telecom hardware and IT hardware (non-telecom). Telecom hardware has further been segmented into aggregation equipment, wireless infrastructure, IP routers and CES, optical equipment, TDM voice infrastructure, and other telecom network equipment. Among telecom hardware equipment, except TDM voice infrastructure and wireless infrastructure, the other equipment types are expected to grow significantly as companies are emphasizing on investing in IP based solutions as compared to legacy TDM based infrastructure. On the basis of services, the market is segmented into EPC and others. Others has been further segmented into consulting, network designing, installation and maintenance, and testing & optimization. EPC service is expected to hold larger share throughout the forecast period. This is because it becomes convenient for telecom operators to outsource their entire site development project to a third party. In terms of network type, wireless infrastructure is expected to experience significant market growth during the forecast period due to the increasing 5G rollouts. Major strategies adopted by telecom operators include strategic acquisitions and partnerships. Major telecom players studied in the report are China Mobile Ltd., Verizon Communications Inc., AT&T Inc., Vodafone Group plc, Nippon Telegraph & Telephone Corporation, Telefonica S.A., America Movil, China Telecom, and SoftBank, Deutsche Telekom. These telecom service provider either purchase hardware form OEMs or avail services from EPCs. Some other significant EPC players active in the telecom service provider investment (CAPEX) are Bechtel Corporation, Jacobs, Black & Veatch Holding Company, KCI Technologies, GPD Group, Morrison Hershfield, TECTONIC Engineering & Surveying Consultants P.C., KLJ, and Burns & McDonnell. Various OEMs players profiled areHuawei Technologies Co., Cisco Systems, Inc., Nokia Corporation, Telefonaktiebolaget LM Ericsson, Fujitsu Ltd., Ltd., ZTE Corporation, Samsung, Qualcomm Incorporated,and NEC Corporation.